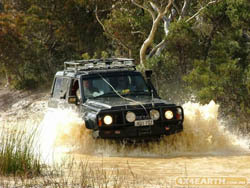 The Tianjara Fire Trail is located in the Morton National Park north of Ulladulla on the South Coast of NSW. At around 20 km the trail itself it provides a great preview of what this sandstone escarpment has to offer with its waterfalls and surrounding mountain and ocean views. The 4wding on this dry weather only trail is moderate but it is compensated by the exceptional views of the likes of Pigeonhouse Mountain, The Castle and Tianjarra Falls. A permit is required which is obtained by phoning the Ulladulla NPWS office. Porters Creek Dam (west of the Princes Highway near Lake Conjola) is start of this route. Head north to join the Tiangara Fire Trail. Early in the trip a narrow causeway is crossed with both sides disappearing vertically. The scenery dominates and the navigation is easy with only one right turn onto the Yarramunmun Fire Trail shortly before reaching the major Turpentine Rd. (Straight ahead is the continuation of the Yarramunmun Fire Trail which is an interesting extension to this trip ending at Nowra). Turn right here and soon on the left is Tianjara Falls which is an ideal lunch spot. It is a short run east along Turpentine Road back to the highway. However this trip explores the minor tracks of 12 Mile Rd, Whalebone Rd, Conjola Ck Rd, Coolabah Rd and Martins Ridge Rd to arrive there.